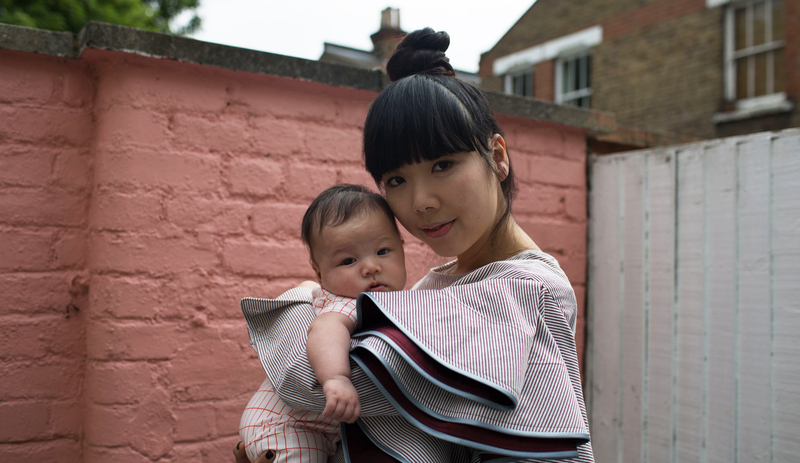 In anticipation of Mother’s Day, we sat down with London-based fashion blogger and new mom Susanna Lau—better known as Susie Bubble—to talk fashion, style, sound, and the effect motherhood has had on her career. How does your name reflect your personal brand? ‘Susie Bubble’ is a nickname given to me by my best friend when I was about ten. I’m not really sure how she came up with it. Either it was my super round face, or that I was always daydreaming in class. Then when I set up the blog, it made sense to connect fashion with that nickname. I wanted to look at fashion from my perspective—within my own bubble, as it were. And that’s how [my blog] Style Bubble came about. You’re a writer as well as a blogger and influencer. What’s the key to balancing all the sides of your creativity? I started my blog because I wanted to write about fashion on the side of my advertising day job. I never thought I could work in fashion, so the blog was my way of practicing my writing. Obviously the role of a blogger has evolved, and it’s become much more image-based. I love the fact that I get to work in multiple capacities — it’s a weird blend of styling, photography, art direction, and journalism. I’m not professing to do all of those things incredibly well, but self-teaching myself all of those things has been really satisfying. It means no day is the same [as the last]. Describe your style. What or who are your influences? Definitely eclectic, playful, and a bit silly. I’m definitely NOT chic. I love anybody who has a strong sense of self in the way they dress—Anna Piaggi, for instance. Or people that I know in real life like the illustrator Julie Verhoeven, who, like me, has a penchant for colors and prints. How do you recommend developing a strong sense of personal style? Not caring about what other people think helps! When I was a teenager, kids from other schools used to laugh at my outfits on the bus, but it only made me seek out style alternatives even more. How do sound and music play a role in what you do? Music is so interconnected with fashion — particularly [fashion] show soundtracks, which I’m forever Shazaming. They set the tone and can provide a bit of insight into the collections. In my work environment, I’m one of those odd people that need a lot of loud noise when writing. When it’s deadly silent, I get a bit creeped out. I love working at home and having my music blaring out quite loud. Of course I have to make sure [my daughter] Nico can nap — that’s where headphones come in handy! What’s in your creative toolkit? All the tech gear! My laptop for working at home and my iPad Pro for typing on the go. Increasingly, I’ve been able to do a lot of image work on the phone — Photoshop Express is great. I also love wireless SD cards for transmitting images from my DSLR camera to my phone. And obviously a good set of Bluetooth headphones now that there’s no headphone jack on my phone. Essential for listening to recorded interviews and transcribing on the go. How has becoming a mother changed your career? Your outlook on work and creativity? It hasn’t changed my career as such, but it does mean I have had to be better organized. For instance, I’m traveling for a week away from my daughter Nico at the moment and I have to make sure there’s enough milk for her before I go (which involves another bit of tech — the breast pump!) Having her also gives me another focus and drive in what I do to provide for her as best as I can, and it has also made me think about the kind of values my partner and I wish to impart to her. At the same time, being a mother also lessens the impact of anything crap that happens, work-wise. Because having her already feels like this monumental achievement. The bottomless pit of love you would feel for something so little. But added to that, the acute anxiety because you’re scared of any little niggle or pain she experiences. It’s why those early newborn days felt so long and drawn out — because everything is a challenge! Tell us about the playlist you put together below. Why are these songs important to you? It’s a mix of current and old tracks. I’ve been thinking back a lot because now I struggle to remember a time before Nico was born, so music is a good way of jogging my memory — like Death Cab for Cutie reminds me of when I was at uni. There’s also a few film soundtrack scores which have resonated with me, as I went to the cinema a lot in my last trimester. It’s an obvious one, but Moonlight’s soundtrack has been on in our house non-stop—just so beautiful and ethereal. Since Nico is still so young, I think any music is good for her to absorb, so we don’t really play children’s music. She kind of gurgles with most music anyway—in particular, Drake gets her going!